If you have questions, please don’t hesitate to contact us at (973) 361-7400. Prices include all costs to be paid by a consumer except for licensing costs, registration fees and taxes. To well qualified buyers, primary lender approval may be required. See dealer for details. Not responsible for typos. Pricing may be subject to change by the manufacturer. Actual vehicle may not be shown. For used vehicle listings: Vehicle may be subj. to a safety recall: go to www.safercar.gov. 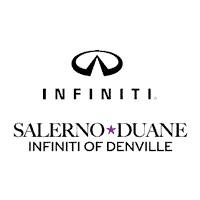 Salerno Duane INFINITI of Denville	40.8679054, -74.5132779.